Bangalore Drupal Meetup - March/April 2018 — Malabya Tewari - Drupal, Devops & Web. Following the footsteps of Hussain, the Drupal guru, I decided to write down about giving a brief about the monthly meetups in Bangalore. So, this month we had on 7th April 2018 in Valuebound office in HSR Layout. 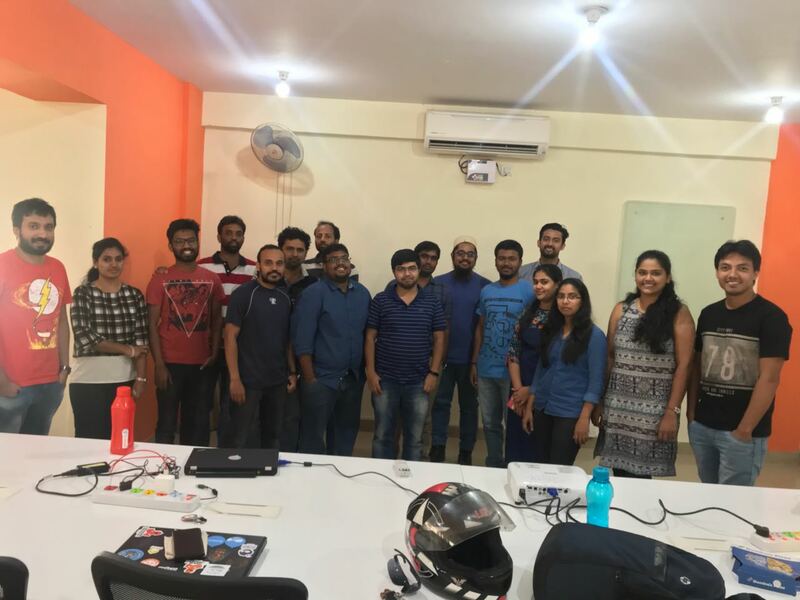 The Bangalore meetups usually happen on the last Saturday of the month, but since the meetup in March couldn’t happen and in April there is the Drupal Camp Mumbai ‘18 the organizers decided to do a combined meetup for the two months to keep the culture of having the meetups alive. The total attendance of the meetups was 17 which was a decent number owing to the short announcement of the meetup. Of the 19 RSVPs, 17 turning up is a big deal in my opinion. The attendees were from companies like TCS, Axelerant, Specbee and of course Valuebound. Out of the 17 attendees, for 2 of them, this was their first meetup, which is really great. The meetup started at around 10:40 AM which a short introduction by Taher welcoming everyone to the meetup and a quick round of introduction of everyone. The first session was from Chirag Shah who spoke about Resorvoir distribution in Drupal. He gave an overview about the various components in the system like JSON API, auto-generated documentation that updates as your content model changes and Oauth for the authention of the APIs. This was followed by a short tea break where everyone can socialize over. After the short break, we had a session by Parvateesam Konapala on AMPifying Your Drupal 8. He introduced the Google AMP project and how it can be integrated with Drupal 8, focusing on guidelines, restrictions, and pros & cons for AMP. He gave a brief walkthrough on how we have AMP pages in Drupal 8 using the AMP module and using the AMP Theme. Then we had a small break with the refreshments of pizzas for everyone provided by Valuebound. After the informative session about AMP and the refreshment, we moved over to an open discussion about Women in Drupal which was lead by Harika Gujjula. This is an intiative to bring in more female developer and motivate them to get involved in the community. It was a fruitful conversation where we discussed about the bottlenecks as why the issue is there and what steps we can take to slowly bring in more female participants in the community gatherings. The discussion concluded with how the meetups can be arranged in future to draw more participants. The meetup ended at 1:30 PM with a group photo. I would like to thank Drupal Bangalore for choosing Valuebound as the venue and would love to host more meetups in future.